The Briton, who will be only the third driver to win at least five titles if he scores eight points more than Vettel on Sunday, will share the front row with the German's Finnish team mate Kimi Raikkonen. The pole was a record-extending 81st for Hamilton, his third in a row in Austin and ninth of the season and he did it with a time of one minute 32.237 seconds -- a track record. "That was very important, that was close," said the Briton as he waved at the throng of fans on an overcast and gusty afternoon at the Circuit of the Americas with rainclouds gathering. "Once we went into that last run, I knew it was quite edgy between us. It was going to require solid laps. The first one was decent but not good enough. The second one was just that little bit better. "The Ferraris are obviously really quick." "After the weeks we had I'm pretty pleased we are back in range. Today has been surprisingly close, I don't think we expected it to be that close," commented Vettel, who vented his frustration over the team radio after crossing the line. Another win on Sunday would be Hamilton's fifth in a row, and Vettel -- also a four times world champion -- would have to finish second to keep the championship alive to Mexico the following weekend. 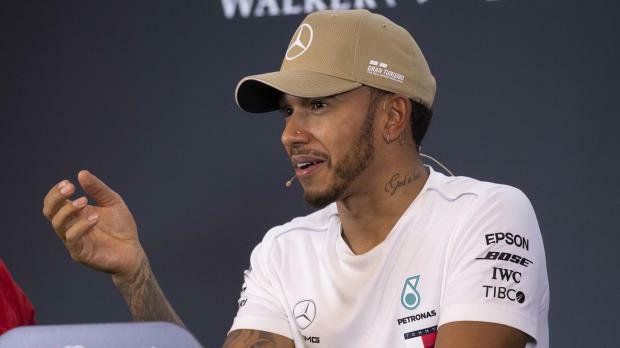 Hamilton's team mate Valtteri Bottas will share the second row with Red Bull's Australian Daniel Ricciardo and neither will be easy for Vettel to get past. Ricciardo's team mate Max Verstappen would also have hoped to be in the mix but the young Dutch driver will start 13th after suffering suspension damage in the first phase of qualifying. "Something broke," he exclaimed over the radio. Force India's Esteban Ocon will start sixth, with Renault's Nico Hulkenberg seventh and Romain Grosjean in eighth place for Haas, Formula One's only US team. Vettel's future Ferrari team mate Charles Leclerc will line up ninth for Sauber while Force India's Mexican Sergio Perez, who has plenty of local support, qualified 10th.